Two pieces of jade art, including “Jadeite Cabbage” from the National Palace Museum’s (NPM) collection, will be on display from Nov. 3 through April 24, 2019 at the Taichung World Flora Expo. “Jadeite Cabbage” is a vivid depiction of bok choy with green foliage and white stalks carved from a green-and-white jade. Along with another jade sculpture of bok choy from Qing dynasty, the two pieces of art are the major highlights featured by the National Palace Museum New Media Gallery in the expo’s Houli Horse Ranch venue. 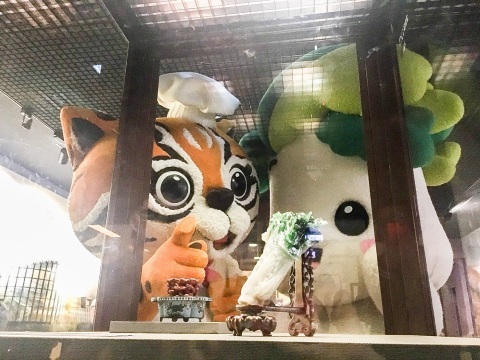 As “Jadeite Cabbage” is a cultural relic that symbolizes agriculture, it echoes the flora expo as well as connotes the agricultural industry in central and southern Taiwan. It is also to remind viewers of land and the origin of agriculture. Moreover, floral designs by countries including Malaysia, Myanmar, and Hong Kong will be installed at the World Gardens of the Forest Expo Site. The International Floral Design & Education Association, Malaysia, for example, will present a rainforest-themed exhibition that features its national flower Hibiscus rosa-sinensis. “The Promise Land-Myanmar Garden,” on the other hand, interprets the characteristics and expectations of Myanmar connoted by the national flag through plants of yellow, green, and red color, which symbolizes unity, peace, and bravery respectively. “The Adventure of the Maritime Silk Road” designed by Hong Kong will take viewers to embark on a journey of Maritime Silk Road, which features characteristic, splendor sculptures and beautiful flowers. In response to the Taichung World Flora Expo, NMP will also hold an interactive exhibition, which will transform horse and flower-themed cultural relics from Northern Song and Qing dynasties into images through utilizing digital projection and interactive device at Houli Horse Ranch. To make culture and art more accessible to everybody, the flora expo has launched the ticket package in collaboration with the Southern Branch of NMP to allow the public to view two jade sculptures in flora expo and one in Southern Branch of NMP. Taichung City Mayor Lin Chia-lung noted that the city government has worked closely with public and private sectors across Taiwan to elevate contents of the expo, hoping to deliver this year’s theme of “green productivity,” “nature sustainability,” and “people with greenabilty” to the world with the highest standard.